Pain in the ball of the foot, also referred to as metatarsalgia, is a very common complaint for which patients seek treatment. There are many ailments that can cause metatarsalgia, some of the more common being Morton’s neuroma, stress fracture, plantar plate tear, capsulitis, and arthritis. Some of these conditions can be difficult for the patient themselves to distinguish between, which brings them to our office. Each of these can have similar initial conservative treatments such as rest, NSAIDs, orthotics and ice, but each have their own specific treatments as well. One of the most frequent causes of metatarsalgia is Morton’s neuroma. 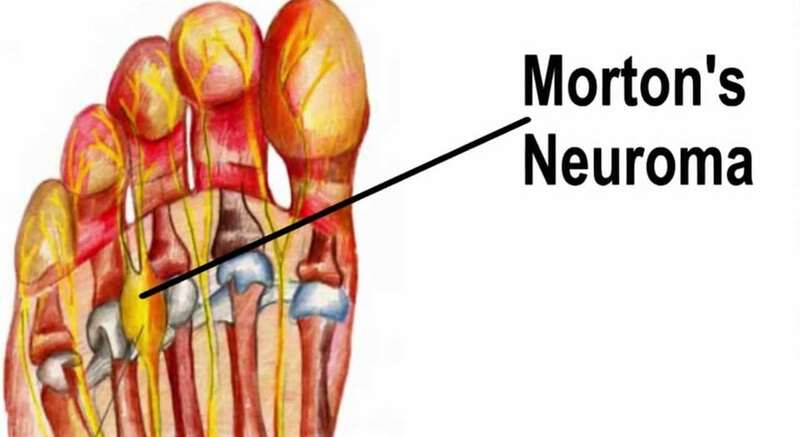 Morton’s neuroma, also referred to as interdigital neuroma, is a fibrous enlargement of the nerve that runs between the metatarsals and then splits to provide innervation to the toes. It is likely the result of impingement and entrapment from a ligament that connects the metatarsals. Symptoms include either a sharp or dull pain in the ball of the foot or toes; burning, numbness, or tingling in the toes; or the feeling of walking on a “stone” or a “bunched up sock”. These symptoms are aggravated by activity and wearing shoes and relieved by rest and massaging the foot. There are many different treatments for Morton’s neuroma including shoe gear modifications, padding, OTC or custom orthotics, steroid injections, alcohol injections, and if all else fails surgery. When looking at medical studies, some have shown that approximately 40% of patients had relief with shoe gear modifications and orthotics alone, but this was a lower percent than with a steroid injection. Another study compared custom orthotics and steroid injection and found higher patient satisfaction with steroid injection. Steroid injection for Morton’s neuroma has been shown to work better if symptoms have been present for less than a year, so it is important to recognize symptoms early. Conservative treatment for neuromas is often very successful but occasionally patients will require surgery. If you are having pain in the ball of your foot, my recommendation would be to see a Podiatrist sooner rather than later. How does shoe gear modification and orthotics treat Morton’s neuroma? Shoe gear modifications include a supportive shoe with a wide toe box so that the metatarsals have room to spread out and not impinge upon each other. Custom orthotics can have a “metatarsal pad” built into them to help splay the metatarsals to prevent the nerve from becoming impinged. They also support the arch of the foot so that our foot functions properly and biomechanics are restored when walking. How do corticosteroid injections treat Morton’s neuroma? Corticosteroid injections help treat Morton’s neuroma by decreasing the inflammation which is contributing to some of the impingement. Steroids are strong anti-inflammatories and injections avoid the systemic side effects of oral steroids, while delivering the medicine to a localized area. The sooner they are given the more relief the patient will have. Sometimes two or three injections are necessary but many times patients get significant relief from a single injection. What if a Morton’s neuroma fails to respond to conservative treatment? If a Morton’s neuroma fails to respond to conservative treatment then surgery may be necessary to relieve symptoms. It is a very commonly performed surgery in which an incision is made in the top of the foot and the neuroma is isolated and removed. This usually involves a simple recovery and the patient can walk in a surgical shoe the same day of surgery. Patients find that this surgery relieves their symptoms but they may have numbness in this area after surgery.